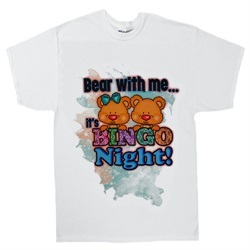 This is a white Bingo themed Gildan T-shirt. The transfer on this shirt is large, bright and vibrant! Many colors and patterns encompass the background with a boy and girl bear peering over the word Bingo. Surrounding the little bears it says, "Bear with me... It's BINGO night! ".